The neoconservative Weekly Standard said Wednesday that Big Tech should ban more people and there's "no reason" conservatives should be defending Alex Jones. 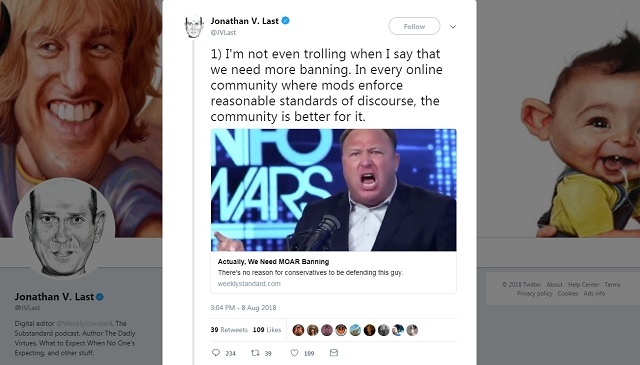 "I'm not even trolling when I say that we need more banning," Jonathan Last said Wednesday on Twitter, linking to his column, "The Case For Banning Alex Jones." "In every online community where mods enforce reasonable standards of discourse, the community is better for it," Last said. Bill Kristol himself also tweeted out the article, adding, "Goodbye, Alex, and good riddance." Last said in his column that Alex Jones has "no First Amendment case" because he's being banned by "privately owned companies" and he's merely "being denied access based on his behavior and actions, not who or what he is." "Alex Jones has his own website," Last said. "On it, he can publish anything he likes." There is one case that you can envision where the utility/equal-access argument might hold: If Google decided that they were going to ban Alex Jones from search results, then Jones defenders might have a point. Google is so dominant, and search is such a core function, that it could reasonably be viewed almost as the doorway to the internet. You could make a very good case that Google Search functions like a utility. But that�s not what we�re talking about here and even looking at Google Search in this way highlights the degree to which the entities in question are nothing like utilities. Google downranked every alternative media site over the last year (including non-establishment left-wing news sites) and made them no longer show up in most popular search results. They did the same on YouTube in even more dramatic fashion. When you search most news topics now, Google only shows you search results from around 300 or so major media sites which their army of censors deemed worthy. Information Liberation has been largely delisted from Google. You can try Googling the title of any of my popular articles and you'll see my own site doesn't even show up. I would assume this was due to Google's 10,000 strong army enlisted to flag search results (which banned Infowars immediately only to back down after it was exposed by a leaker). Have you seen all of the conservatives asking �What about Farrakhan?� There are a ton of bad users out on the tech industry�s leading platforms. But saying that these platforms shouldn�t ban Alex Jones because they haven�t banned all of the bad actors is like saying that the DA shouldn�t prosecute one criminal because the police haven�t caught every other criminal. The answer here is obvious: Tech companies shouldn�t give Jones a pass; they should get rid of the Farrakhans of the world, too. The perfect should not be the enemy of the good. Last week, Kristol said "my fellow white men" are a "great disappointment" to him because of their conservative voting habits and said he's hoping "women, minorities and young people" can "step up to save the republic." I�ve been looking at some polling crosstabs and I�ve got to say to my fellow white men over 55: You�re a great disappointment to me. On the other hand it seems fitting and consistent with the American story that women, minorities and young people now step up to save the republic. Last's column encouraging the right to stand down and be rolled over by Big Tech so Democrats can seize control of the country furthers Kristol's goals. 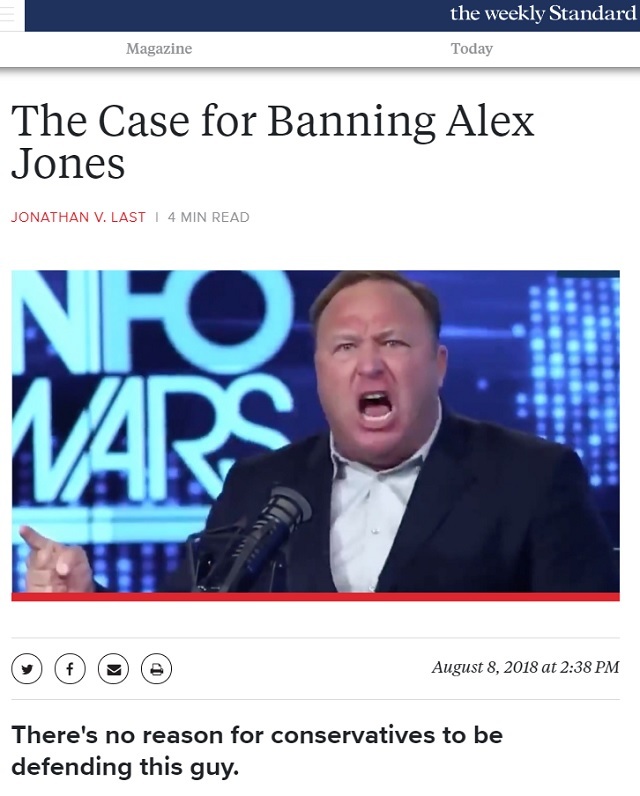 Last's call for more bans aligns perfectly with Democrat Senator Chris Murphy who said on Monday that the "survival of our democracy" depends on more sites like Infowars being banned.